Gretchen Franklin, who has died at the age of 94, spent nearly 80 years in showbusiness. But she enjoyed her greatest fame as the elderly Ethel, a favourite character in BBC soap EastEnders. 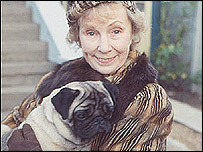 Her monologues with her pug dog, "my little Willy", provided some of the show's lightest relief. She was born in south-west London, into a theatrical family. Her father had a song-and-dance act, while her grandfather was a well-known music hall entertainer at the turn of the century. So it was no surprise when the teenage Gretchen Franklin made her debut as a pantomime chorus girl in Bournemouth at £2 a week. In her words, she was just a rather plump little girl. "But I was very ambitious," she said. In 1929, she took dancing lessons at the Theatre Girls Club in Soho in London's West End. She soon became a renowned tap dancer and founder member of a quartet known as Four Brilliant Blondes. She toured with the Gracie Fields Show, married Caswell Garth - a writer of revue sketches - and performed with another dance group, The Three Girlies, before making a gradual switch to straight dramatic roles. Franklin appeared in several productions for the BBC and on stage. 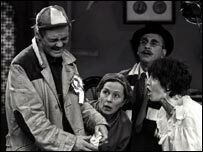 She was playing in the West End in Spring and Port Wine in 1965 when she became the first Mrs Alf Garnett in a pilot episode of Til Death Us Do Part, with Warren Mitchell. But she missed the chance to become a permanent part in what was to become a hugely successful series - because she couldn't obtain her release from her stage role. During the 1970s, Gretchen Franklin starred in two soaps, Crossroads and the short-lived Castle Haven. But it was EastEnders, where she played Ethel Skinner, that made her a familiar figure for 15 million viewers. She exchanged gossip and bickered with her bosom pal, Dot Cotton, as she shamelessly exploited any opportunity to celebrate in the Queen Vic. In 1999, Ethel left Albert Square and the series. But she was back a year later, a twinkle still in her eye as she enjoyed her favourite tipple. 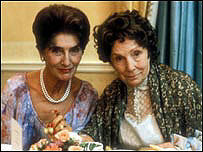 And Franklin was to be at the centre of one of the series' most dramatic storylines, as Dot Cotton helped Ethel to end her life. Whether on or off the EastEnders set, Franklin was an irrepressible spirit. While 15 million viewers watched her TV funeral in 2000, she confessed that she didn't. And she added, with characteristic mischief: "I won't miss being on the show, but I will miss the salary."